Tom sat against a tree, alone in the darkness of a forest. He had no idea where he was this time, but after his experience in Resident Evil he just wanted to rest. Technically he didn’t need it, being without a physical body, but old habits die hard and he struggled to close his eyes and forget about his troubles in slumber for just a few minutes. It didn’t work; sleep was something he was no longer privileged to, and he was left only with his thoughts. Tom was afraid. The game system, I.D.E.A.S., seemed to be sentient and was now actively testing him. He had no idea if it actually wanted to hurt him or was merely playing with him, or whether it knew the difference. Either way, his recent victory over it seemed to have earned him a much-needed respite. He sat for another minute, collected his thoughts, then rose and set out to explore the area around him. A second later he was back on the ground, having slipped on something small and hard. “Ow ow ow,” Tom muttered to himself. “Stupid rock…stupid game…wait a sec.” Tom took a closer look at the object he had slipped on. It was perfectly round, half red and half white, with a switch on the top. “Oh no. Oh no no no no no. No no no no no. Pleeeeeease no.” Tom reached over and picked up the sphere, and felt his heart sink as his worst fears proved true. He was holding a Pokéball. “Whoah, don’t get all bent out of shape. I’m here.” Rick was back. “The game?” Rick asked skeptically. “Yes, yes. All right. 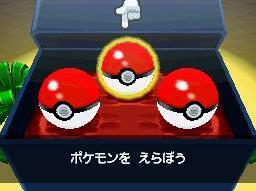 Now let’s see what I have here.” Tom grasped the Pokéball in his hand. “Pokéball GO!” he shouted, before he could catch himself. He swore he could feel Rick’s icy gaze on him. The ball flew through the air and hit the ground with a flash. In its place was a small blue fish-creature smiling happily at him and wagging its tail.